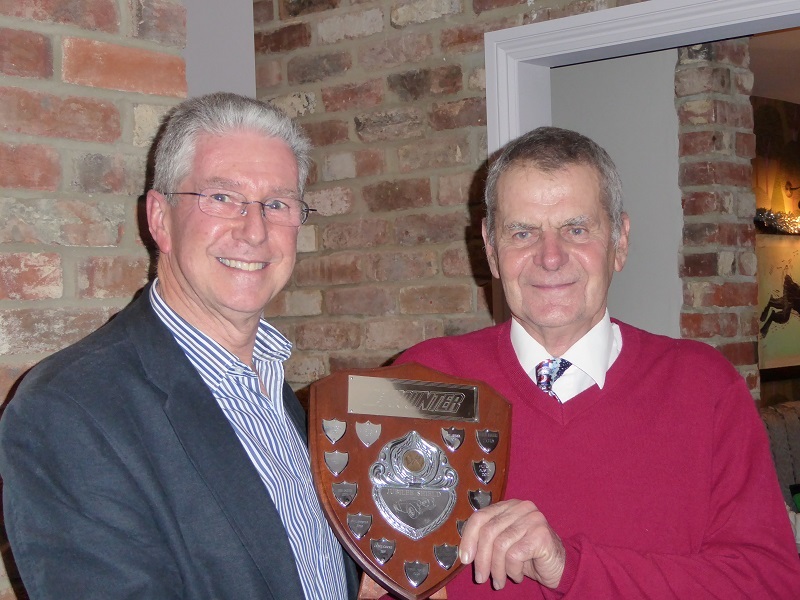 The award was presented at the New Forest 'Laying Up' Supper in December 2015, by New Forest Events Manager, Dave Larder (left). 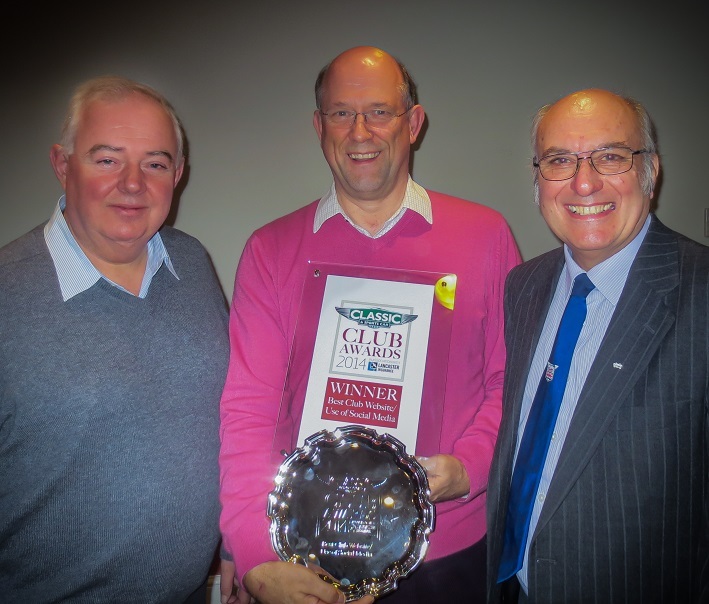 The award was made to David Tofts (right) for the best Rev Counter article of the year. 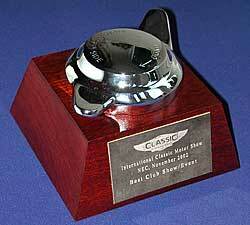 "Bob & Stella Gilleland Trophy"
* This year we have a new trophy for the 3000 MK2A and MK3 class. It has been donated in memory of the late Malcolm Hadley, one of our best friends who passed too early. The award was presented at the Club AGM in December 2014, by Club Vice President Peter Healey to Northern Centre Director, Tony Curran. He received the award on behalf of Northern member Paul Johnson for his article on what lay hidden in his car YRD385C and its rebuild, published in the November edition and deemed to be best article of the year. 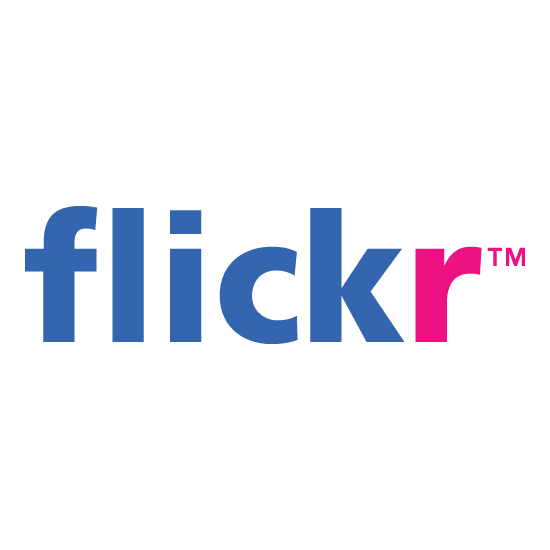 This award was announced after the close of the second day at the Classic Motor Show at the National Exhibition Centre, Birmingham, UK, on Saturday 15th November 2014. 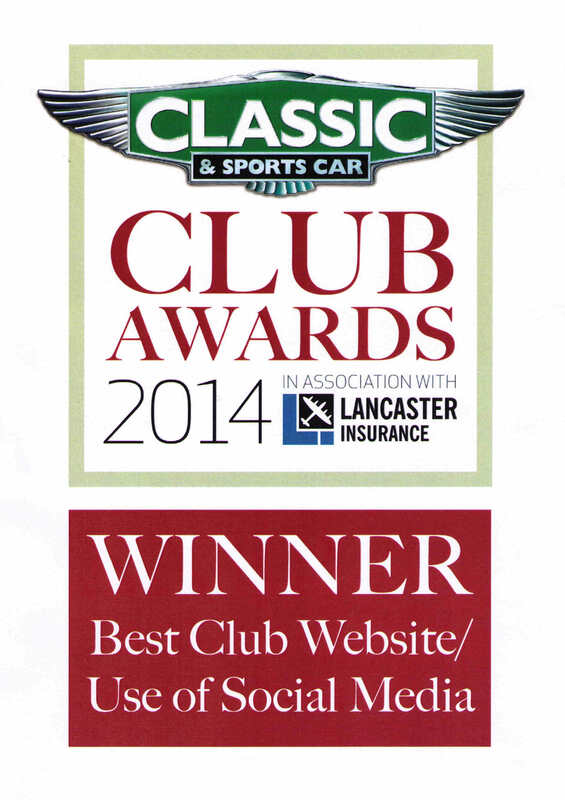 Won by the AUSTIN HEALEY CLUB (Force 12 Ltd/Jim Palmer) for its national club web site. 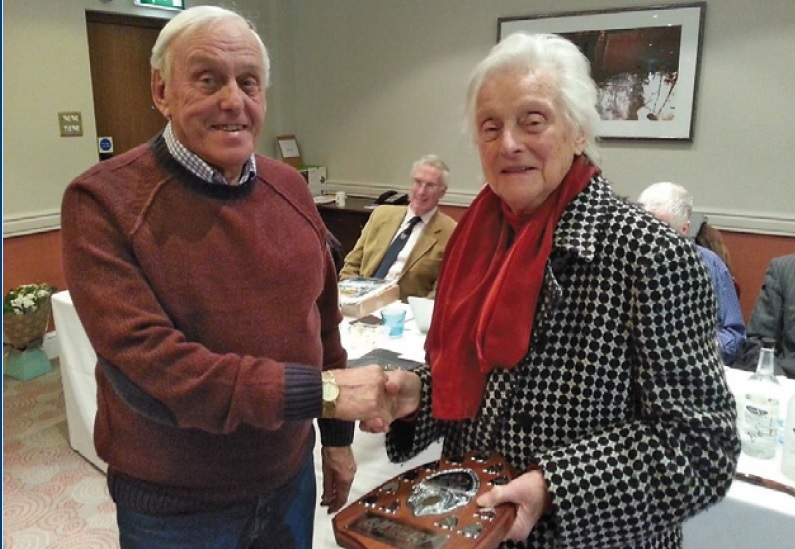 The award was presented at the Club AGM in December 2013, by Margot Healey to Southern Counties Centre Director, Derek Edwards, who received the award on behalf of Peter Harris for his and Joanne's story of the 'Dambusters, published in the July edition and deemed to be best article of the year. National Healey Day 2007 was held together with MGLIVE! at Silverstone. 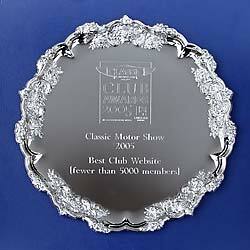 The Club did not stage a National Concours there, so there were no trophies awarded in 2007. 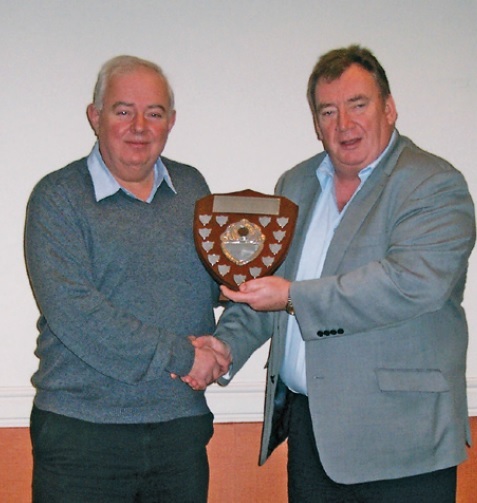 The award was presented at the Club AGM in December 2006, by Club President Colin Stokes, to Phil Broster, for recognition of his contributions to RevCounter during 2006 . 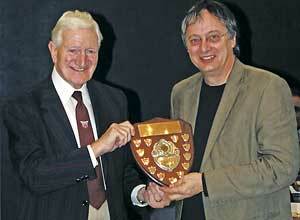 The award was presented at the Club AGM in December 2005, by Chairman John Keener, to Derek Chadwick . This award was announced after the close of the second day at the Classic Motor Show at the National Exhibition Centre, Birmingham, UK, on Saturday 5th November 2005. 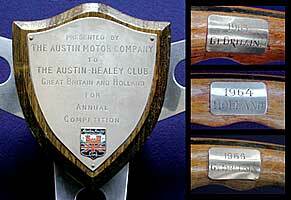 Won by the AUSTIN HEALEY CLUB (ProAxis/Alan Cross) for its national club web site. 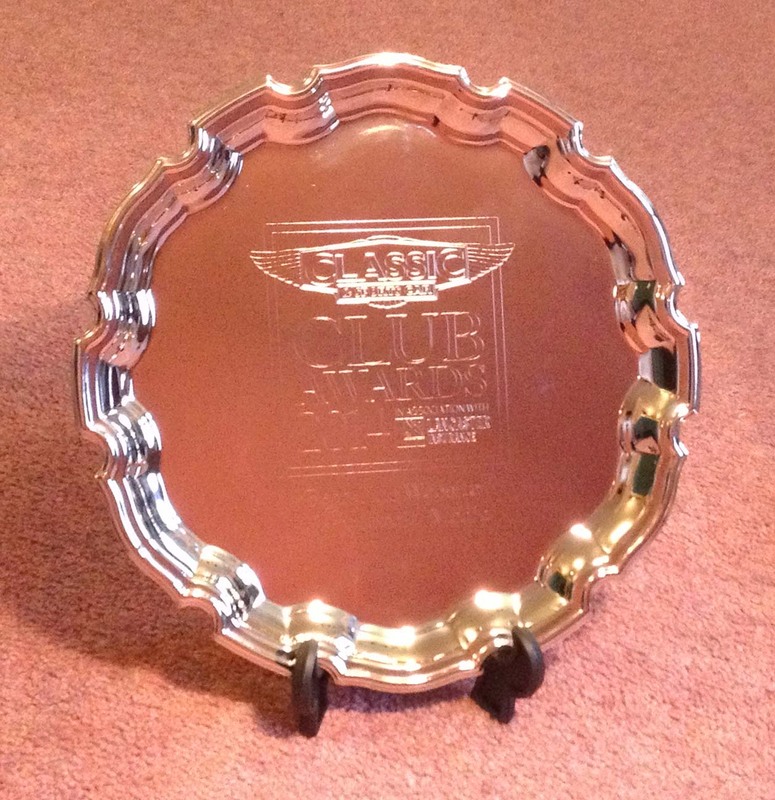 This shield, presented to the Club by Ron Fitton, editor of Revcounter, and his wife May, is for the best submission for publication in the magazine during the course of the year. The award was presented at the Club AGM in December 2004, by Chairman John Keener, to Ivor Davies (Northern Centre's Secretary and Treasurer) for his article on the European meet. This award was announced after the close of the first day at the Classic & Sports Car Show at the National Exhibition Centre, Birmingham, UK, on Saturday 9th November 2002. "The winner was THE AUSTIN HEALEY CLUB & Phil Gardner for their week long 50th anniversary celebrations. They had over 650 cars, including many from around the world, and had no less than 49 race/rally cars on display, with several of the original drivers reunited with these cars. 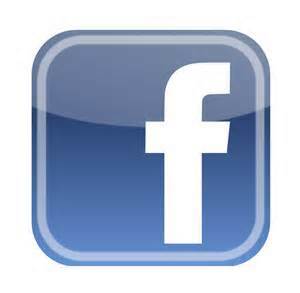 Many visitors were from South Africa, Canada, Japan, Austria, Switzerland, Norway, USA, Australia, Norway, Germany, France. Belguim, Canada." Well done to Phil & all his Committee on this great achievement. Fiat 500; BMW 50; Triumph for their 25yrs jubilee; and Rover P5 for 'Classic on the Common'. 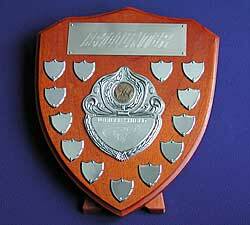 This shield, presented to the Club by Ron Fitton, editor of Revcounter, and his wife May, is for the best submission for publication in the magazine during the course of the year. The award was presented in December 2002 to Mike Keen for his article in the August 2002 edition entitled Healey Ownership. This trophy was initially a bit of a mystery. It was found on a rubbish tip of all places, sometime around 2002, and offered to the Club. 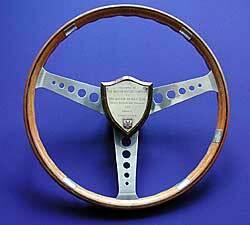 As you can see, it was donated by the Austin Motor Company. Member Bill Cummings has since elucidated that it was the result of exchange visits between the UK and Dutch Austin Healey Clubs in the 1960s. The highlight of each visit was the driving test competition between the two clubs. It was first awarded in 1962 when the Dutch club won it, though it was never engraved to show this. In 1963 Great Britain won it, in 1964 Holland, and in 1965 the UK club again - the last time we believe this trophy was awarded. The club is of course delighted to have this wheel back in the trophy locker.